Great unit! Light, loud, crisp and clear. Ricks sounds are second to none. Called up a yote where I hadn't been able to in the past. She had heard that ol song before. But Ricks sounds brought her in in about 10 minutes. Thanks again Rick, can't say enough about the quality of the Revolt!!!! We are figuring out what calls work for our area. Calling them in a lot now. This thing is LOUD, you will be happy with the sounds and volume. Plenty of settings to use, this has all the bells and whistles. The crow call had the crows practically landing on the call, same with the cotton tail, thought the coyote was going to attack the call. We've only had the call about a month, but so far are very happy. Had an issue with the remote, but they're sending us another one. I'd def recommend!! Purchased the Revolt as well as Ricks top kill sounds and New Distress sounds! Of the 5 ecalls I own, the Revolt is far and away the best. The clarity and volume of the Revolt is just plain amazing. Rick's library of sounds is unmatched by any other manufacturer. I would like to see, a backlit keypad on the remote. 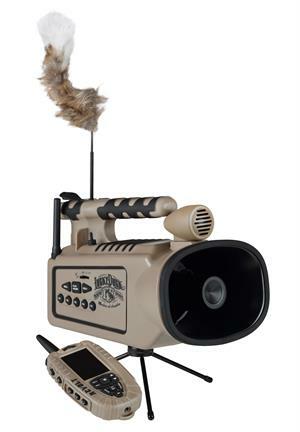 Before i got this call i was debating on a foxpro or this for a long time. Untill ive heard great things from many people and talking to Rick made it a easier decision. I still didnt know what to expect but when i got the call all i can say is Wow!! The sounds are just unbelievable and the best call to say the least. In my opinion this call is the best coyote call period. Has options that are second to none. Ricks sound library is unbelievable, by far the best vocals money can buy. This is the best call on the market, by so far, there is no second place. Best sound library period! great remote that will allow you to work with 4 callers from the same stand. I don't about you but one primary caller is about all I can get around with considering all the other stuff, most of us carry. That is where the REBEL comes in, great volume you can play 2 sounds at the same time, and it is very compact. Get one of these to use with your primary unit. The REBEL is only 119.99. How they can build a unit that great for that price I don't know.